Hi there! Here is today's edition of TC Daily. If this mail was forwarded to you, please take a moment to subscribe so you don't miss out on future editions. Sanofi, through Afric@Tech (its dedicated innovation lab), invites health tech companies in Nigeria and Ghana to submit solutions to three health challenges. The deadline for submissions to Sanofi is 15 February, 2019. The solutions will be evaluated by a jury of professionals. Successful candidates, supported by Sanofi, will present their solutions at Viva Technology in Paris on 16 – 18 May, 2019. Interested participants can access information here. Please make further inquiries by sending an email to info.nigeria@sanofi.com. Kingson Capital, a Durban based venture capital company announced the launch of a R400 million (~$5,600,000) fund targeted at tech startups and black-owned small businesses. According to Ventureburn, company founder Gavin Reardon said that while the VC might invest across all stages, his team prefers to invest in serial entrepreneurs who have started and run businesses before, even if they weren’t successful. Facebook has partnered with Dubawa, a Nigerian Online platform, to intensify the fight against fake information in the country. According to The Guardian, Adaora Ikenze, Facebook’s Head of Public Policy for West and Central Africa said on Monday that the partnership came following the recent launch of Facebook’s Third-Party Fact-Checking programme. The Third-Party programme is to help assess the accuracy of news and reduce the spread of misinformation. Globacom has announced that it will be rolling out its Glo2 fibre optic infrastructure in 2019 from Lagos to Niger Delta states which would provide high-speed broadband services to oil companies as well as link up the cable to the northern states. Gauteng is the most affordable South African province for tech employees to rent in on average, in terms of rental costs as a percentage of a tech employee’s salary. This is because Gauteng offers the highest tech salaries in the country. Here's a breakdown of how much IT professionals pay for rent in South Africa based on a report by jobs website Adzuna. Techzim reports that the six innovation hubs being constructed in universities across Zimbabwe are nearing completion, as announced by the country's Minister of Higher and Tertiary Education, Professor Amon Murwira. The Nigerian Communications Commission (NCC) has announced plans to introduce a code of practice for internet service providers (ISPs) in a bid to curb cyber-crimes in Nigeria. According to ITNews Africa, the new code will help to secure the country’s cyberspace against imminent threats from attackers and also address issues such as online child protection, privacy and data protection and objectionable contents among others. An extract of The State of Health Tech in Nigeria, an industry report by TechCabal about Nigeria's health tech sector, is now available for download on the event page. You can also watch highlights from our Health Tech Townhall here. At Avon HMO, we're passionate about empowering you to live a healthier, fuller life. Our health plans have been created to give you access to quality healthcare services whenever you need it. Click here to find out more. You can also ​check out our blog, Live |Love|Discover. It is full of tips to help you stay healthy and get more out of life. Kola Tubosun is returning to Google as project manager for Natural Language Processing Tasks. He worked with Google between 2015 and 2016 on a Nigerian English voice project and has actively helped to improve local language experience with tech products, like YorubaName. In this article, he mentioned Google's efforts with language processing and their interests in building capacity for local languages with Google systems. His return looks like we can expect more in that area. Congratulations Kola! Over 12 million consumers now use the "Do not disturb" (DND) service to stop getting spam messages from telecoms companies in Nigeria, Technology Times reports. The NCC also says it has recorded a substantial number of reports under its consumer protection activities and 78% of the complaints were resolved. There's more here. 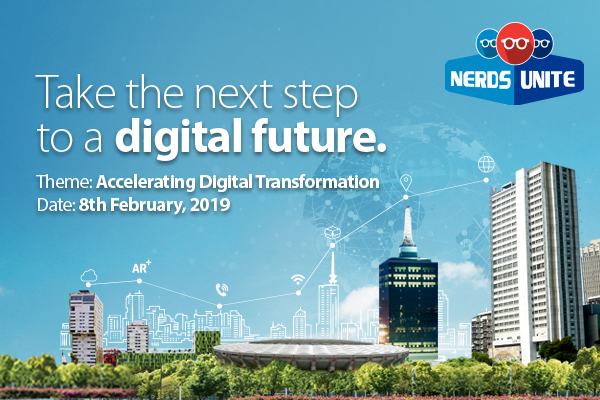 MainOne's Nerds Unite 2019 conference is themed "Accelerating Digital Transformation". This invite-only tech conference targets MainOne's global, enterprise and start-up ecosystem. It will feature over 20 global and African speakers who will provide insights about tech disruption in Africa and the role of connectivity and cloud services in driving growth. Be part of the conversation by registering here. Someone needs to see this, share the digest.